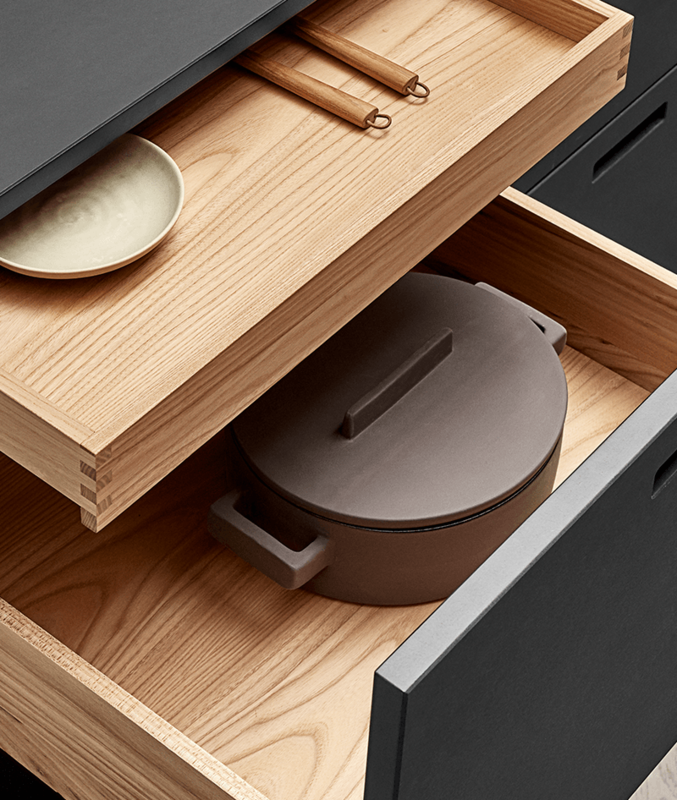 Are you dreaming about finger-joint drawers for your kitchen? 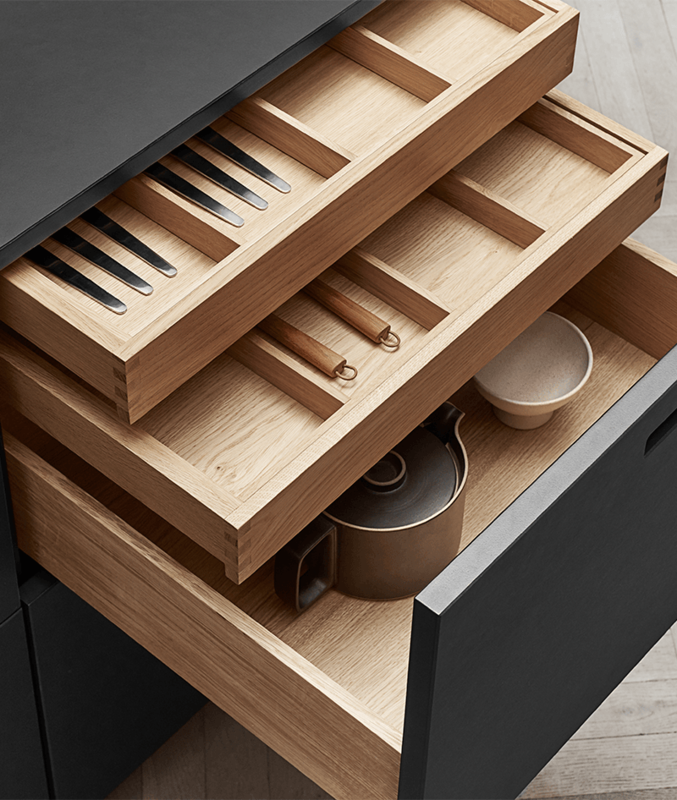 We can deliver beautiful wooden drawers in cabinet-maker quality that fit with IKEA’s kitchen system Metod. You can choose between three beautiful types of wood: fumed oak, oak, and elm. Prices from 1.213 DKK. Incl. VAT. Prices from 800 DKK. Incl. VAT. Prices from 800 DKK. Incl. kr. VAT. 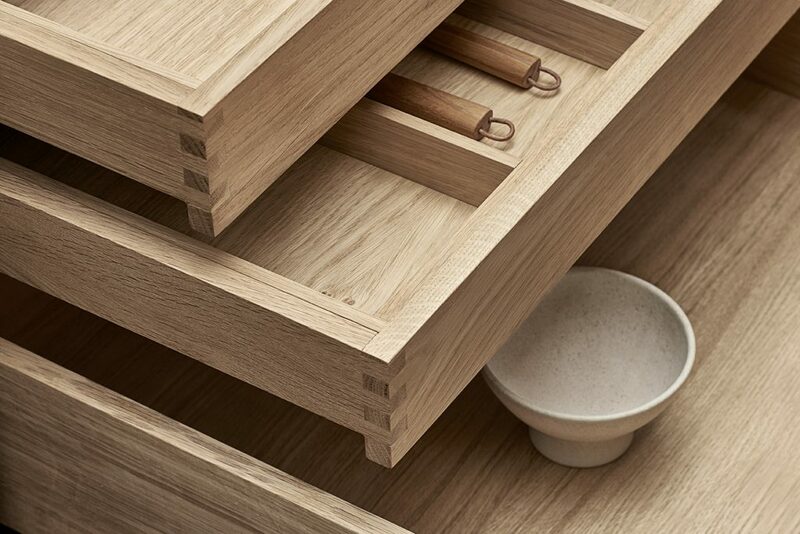 All of the drawers are finger-jointed and produced in carefully-chosen solid woods. We have chosen to oil them so they have a warm and beautiful appearance and a pleasant surface. The fact that they are oiled makes them easier to maintain and freshen up if they get scratches, as opposed to drawers with a varnished surface. We have designed and produced nine different cutlery inserts, so all your dreams of order in the drawers can be fulfilled. There are both small and large inserts, with few or many divisions. They fit with all three drawer sizes: 40, 60 and 80 cm, and are available in every three types of wood. 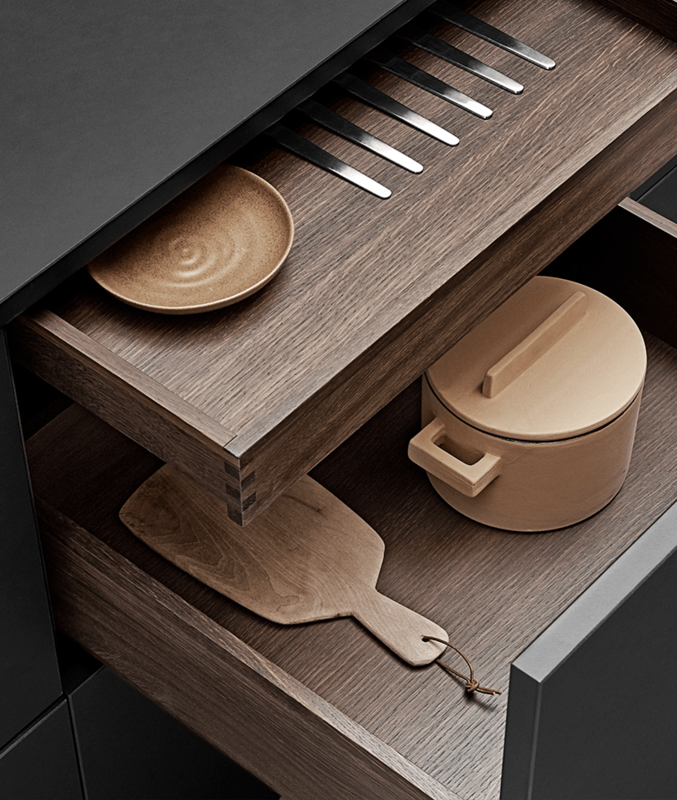 With an &SHUFL kitchen and wooden drawers, you’ll get a kitchen of cabinet-maker quality both inside and out. But how much does it cost to install wooden drawers? Most people need three drawers below a kitchen counter: one large, one medium, and one small, usually the top drawer. At IKEA all three together cost 850 kr. For an additional 2.700 kr per cabinet you can upgrade to wooden drawers in oak. A lot money, but not so expensive for the quality and the enjoyment of being able to open beautiful drawers every day. We have chosen to keep our prices low so you have the opportunity to take this experience home with you. Little drawer 60×50 988 DKK. Middle drawer 60×50 1.150 DKK. Large drawer 60×50 1.388 DKK. Total (drawers for one base cabinet) 3.526 DKK. Incl. VAT. All prices are in Danish kroner (DKK). All prices include VAT. and do not include delivery. We are not responsible for incorrect prices or price changes. If you already know which wooden drawers you want, we’ll quickly put together an offer for you, so you can see how much they will cost. If you buy a kitchen at the same time you buy the drawers, we’ll create a drawing for you and your installer that will make it easy to see how the drawers should be installed. The drawers will be delivered with the rest of the kitchen, along with the accessories for installation (screws, tracks, and a drilling template) which are of course included. At the same we have created an easy-to-read installation guide you can give to your installer. Would you like to have wooden drawers? Send us a mail at hello@andshufl.com or discuss it with our architects if you come to Copenhagen and visit our showroom, here you can also see the wooden drawers.